MR. COUGHLAN: Sir, before I continue with the outline statement, if I could just very briefly interpose a short witness for purely technical purposes. Ms Dominique Cleary please. MR. COUGHLAN: Miss Cleary has already been sworn. You are a solicitor in the law agent office of the Bank of Ireland? That’s correct. I think pursuant to an order, you are here today to produce to the Tribunal original documents, the subject matter of an order for production, isn’t that correct? That’s correct. And can you confirm that the documents you have are the originals and you are submitting them now to the Tribunal pursuant to the order? Yes, they are the originals. Thank you very much indeed. CHAIRMAN: Thanks very much for your attendance, Miss Cleary. MR. COUGHLAN: I might continue, Sir. Obtaining information concerning the Cayman operation after 1984 has become extremely difficult. This is due in part to the fact that, from that date onward, the Cayman operation ceased to be a subsidiary of Guinness Mahon. In that year Guinness Mahon Cayman Trust became a wholly-owned subsidiary of Guinness Mahon & Company, the London parent of the Dublin bank. Subsequently as a result of the involvement of Ansbacher and the involvement of certain directors that participated and acquired that entity, Guinness Mahon Cayman Trust which ultimately became Ansbacher from the London parent company. In addition, ultimately the ownership of Guinness Mahon Cayman Trust passed into the hands of Ansbacher Cayman, a company associated with Henry Ansbacher & Company, London. Eventually, the ownership of the bank passed to First National Bank of South Africa. The Tribunal has nevertheless encountered considerable difficulty in obtaining information concerning the activities of Ansbacher notwithstanding the changes in ownership. In forming a picture of the Ansbacher activities under the control of Desmond Traynor, it should be borne in mind that from about 1992 onwards, part of the funds under the control of the late Mr. Desmond Traynor and associates came under the umbrella of an entity known as Hamilton Ross Limited. For some time from 1992 until in or about 1995, some of the funds held under the Ansbacher umbrella were held in the name of Hamilton Ross. From in or about 1995 onwards, the Hamilton Ross funds were removed from under the Ansbacher Cayman umbrella. From that time onwards, they were separately controlled by Mr. John Furze who, by that time, appears to have terminated his association with Ansbacher Cayman. The operation from that time onwards was mainly concentrated on the Hamilton Ross funds. Mr. Charles Haughey continued to deal with this much reduced Ansbacher/Hamilton Ross operation now confined in the main, as far as the Tribunal can see, to the funds under the control of Mr. Furze in Hamilton Ross. Apart from the difficulties the Tribunal has encountered in obtaining information from Ansbacher, it would appear that as a result of an exercise carried out in this jurisdiction following the death of Mr. Desmond Traynor, a considerable number of paper records relating to the Ansbacher operation were destroyed by Mr. John Furze. Mr. Furze, with the assistance of Mr. Collery, had removed all of the paper documentation concerning the Ansbacher operation to the offices of Management Investment Services under the control of Mr. Sam Field-Corbett at Inns Court, Winetavern Street, Dublin. In the course of a three-day period in those offices, Mr. Furze, with the assistance of Mr. Collery, destroyed more than half the paper documents. During all of this time, the Ansbacher operation continued to provide services to its Irish clients or Irish customers including, as evidence given at earlier sittings of the Tribunal suggests, Mr. Charles Haughey. There is one further feature of the overall conduct of the Ansbacher operation which is more readily exemplified by information made available to the Tribunal concerning Mr. Denis Foley, TD. Although Mr. Foley himself has provided the Tribunal with considerable assistance concerning these matters, the manner in which the Tribunal’s attention was first drawn to Mr. Foley’s affairs would itself appear to be something warranting inquiry into connection with the conduct of the Ansbacher operation. Mr. Foley has been a TD since 1981 with one break between 1989 and 1992 when he held office as a senator. He has also held offices as both chairman and vice-chairman of the Public Accounts Committee. Mr. Foley has informed the Tribunal that his association with Mr. Desmond Traynor goes back to the mid-1960s and an association he had with the Mount Brandon Hotel in Tralee. At the time, he was a rate collector. In addition, he was also involved in arranging for bands to play in the new Mount Brandon Hotel and also provided assistance in arranging publicity for the hotel’s ballroom. As part of this arrangement, he was in receipt of payments both from the Mount Brandon and from the bands and, in addition, from similar work he did for the Central Hotel ballroom in Ballybunion. Around this time he met Mr. Desmond Traynor who was involved with the Mount Brandon Hotel in his capacity as an accountant with the firm of the Haughey Boland. In a Memorandum of Evidence provided to the Tribunal, Mr. Foley has stated that in or about 1975 or 1976, Mr. Traynor informed him that, through the Guinness & Mahon bank, he would be able to get Mr. Foley a good return on any funds he might have to invest; that some years later, in or about 1979, Mr. Foley decided to invest some £50,000 which he had accumulated from his own resources with Guinness & Mahon; that he gave the sum to Mr. Traynor; and that in return he received two Guinness & Mahon lodgment dockets, one for £30,000 and one for £20,000. Mr. Foley has stated that he was informed by Mr. Traynor that his monies would be invested in a fund entitled “Klic Investments” and that Mr. Traynor informed him that he would be furnished with statements on a periodic basis. Notwithstanding requests, he was not in fact furnished with statements until in or about 1982. The lodgment dockets have been made available to the Tribunal and while they mention Mr. Foley’s name and the amounts, they do not mention any account number and the Tribunal has been informed by Guinness & Mahon that Mr. Foley had no account with the bank as of the date of those lodgment dockets in any of those amounts or in the aggregate of those amounts. Nor has Guinness & Mahon been able to trace the lodgments to any account in the bank such as a bank suspense account into which these sums might have been lodged pending their ultimate allocation to some other nominal account in the bank. Mr. Foley received two further intimations of the state of his investments and has informed the Tribunal that at one point he received a simple slip of paper from Mr. Traynor with the word “Klic” on it and the amount STG £72,893 and later on, in 1988, he was informed by Mr. Martin Keane, an official of Guinness & Mahon, that his investment stood at STG £82,688 and that he, Mr. Foley, noted this in his own handwriting on the same slip of paper given to him at an earlier date by Mr. Traynor. Mr. Foley has stated that he made two withdrawals from his investment and that this was done by arrangement with Mr. Traynor; a withdrawal in the amount of £20,000 on the 13th April 1989 and a withdrawal in the amount of £10,000 on the 16th June 1993. He has informed the Tribunal that the first withdrawal was furnished to him in the form of a draft drawn on Guinness & Mahon at its branch in South Mall in Cork and that the second withdrawal was paid in cash. Guinness & Mahon has informed the Tribunal that they have no record of any draft issued by Guinness & Mahon at either its Dublin or Cork branches between the beginning of March and the end of April 1989, save for one draft payment to a semi-state body. In relation to the £10,000 cash withdrawal, the Tribunal has been informed by Irish Intercontinental Bank, the bank with whom most of Ansbacher/Hamilton Ross business was transacted from January 1991, that it appears from a statement of account number 02/013584/81, that on the 16th June 1993, a sum of STG £9,890 was withdrawn and converted from sterling to Irish pounds to fund a cheque for £10,000 payable to the Bank of Ireland. The account from which the sterling amount was withdrawn was an account in the name of Hamilton Ross and is the same account from which debits were made to fund cheques payable to the bill-paying service operated for Mr. Charles Haughey by Mr. Jack Stakelum of BEL Secretarial. It would appear that the £10,000 cheque payable to the Bank of Ireland is represented by a credit to an account in the Bank of Ireland in the name of Kentford Securities, an account which, as evidence already given to the Tribunal has shown, was frequently used by Mr. Desmond Traynor to process transactions of the Ansbacher operation in this country. The lodgment is shown on the overhead projector. On the 17th June, there was a lodgment of £10,000. It would appear that the same amount was withdrawn from the account some few days later. The account is on the overhead projector – the statement of account shows a debit on the 24th June for £10,000 cash. Mr. Foley has informed the Tribunal that notwithstanding the dealings I have just referred to, namely the payments to him by Mr. Traynor by way of withdrawals by Mr. Foley in respect of investments, his contacts with Mr. Traynor following his election to Dail Eireann in 1981 were very rare. He has, however, stated that he telephoned Mr. Traynor on a number of occasions and that he called to see him on two occasions at his office in Fitzwilliam Square to discuss how his investment was progressing. In his Memorandum of Evidence, Mr. Foley has stated that following Mr. Traynor’s death in 1994, he became concerned about his investment. He eventually succeeded in making contact with Mr. Padraig Collery in August 1995, informing him that he was anxious to make a withdrawal of £50,000 from his investment and that he also wished to obtain statements. Mr. Collery informed him that his investment was being dealt with by Mr. John Furze but Mr. Foley had not heard of that name before and has stated that he has never met or dealt with Mr. Furze. It would appear that in early September 1995, Mr. Foley had an arrangement to meet with Mr. Padraig Collery at Jurys Hotel in Dublin. Mr. Collery met him and provided him with a sum of £50,000 in cash. This Mr. Foley converted into two bank drafts which he obtained from the Bank of Ireland in Tralee and he has informed the Tribunal that he has kept these since that date with a view to paying the Revenue Commissioners and that he has indicated that these funds have been applied by him towards discharging outstanding tax liabilities. On the overhead projector, you will now see the debiting of STG £51,425 which converted into IR £50,000 and it is debited from the same Hamilton Ross account that I mentioned a moment ago. From information made available by Mr. Tony Barnes of Irish Intercontinental Bank, it appears that, from the bank records, on the 18th August 1995, the bank received instructions from Hamilton Ross to provide a draft for IR £50,000 and to debit the cost to Hamilton Ross sterling account 02/01354/81. It appears from the face of the letter that a query was raised by the bank as to the payee of the cheque and the bank was instructed to make the cheque payable to Bank of Ireland. It appears from the account statement that on the 21st August 1995, a sum of STG £51,425 was debited to the account in respect of foreign exchange contract note 691639. It appears from the records of the bank that the sterling funds debited to the account were converted to Irish pounds to fund a cheque dated 22nd August 1995 payable to Bank of Ireland in the sum of IR £50,000. That cheque in the sum of £50,000 was lodged to an account in the Bank of Ireland to the name of a company called Darsley Nominees Limited. That account was mentioned by Mr. Samuel Field-Corbett at an earlier sitting of the Tribunal and was an account used in the same manner as the Kentford Securities account had been used for the processing of transactions relating to Hamilton Ross & Company’s dealings with clients in this jurisdiction. The statement of the Darsley Nominees Limited current account shows that on the 25th August of 1995, there is a credit to that account in the sum of £50,000 representing the proceeds of the cheque drawn in favour of Bank of Ireland from IIB. On the 8th September of 1995, there is a debit to that account in the sum of £50,000. Mr. Padraig Collery has informed the Tribunal that it would appear that this represented the funds used by him to provide the sum of £50,000 in cash to Mr. Denis Foley at his meeting with him in Jurys Hotel. According to Mr. Foley, his only other contact with Mr. Collery was to press him for statements and that he received no statements until May of last year. Copies of those statements have been provided to the Tribunal and although they contain the name Ansbacher and Hamilton Ross, Mr. Foley has informed the Tribunal that that was the first time that he had ever seen any document concerning his investment which contained those names. The earlier statements provided to him were of the kind which I have already described in the earlier part of this opening statement, i.e. bank statements containing particulars of credits and debits but from which the letterhead, account name and account number had been cut off. Incidentally, the statement on the overhead projector shows a debit in sterling from that particular bureau account equivalent to IR £10,000. If the statement is pulled to the right for the moment please — this is clear from the remarks contained in the statement. And that appears to be the £10,000 because of the date, the 16th June 1993, which I have already referred to. Apart from the monies I have just mentioned, Mr. Foley has also informed the Tribunal that he opened an account with Guinness & Mahon in December of 1986. This was a resident call deposit account number 10583009. It was opened in 1986 with a lodgment in the order of £3,000-odd and with a number of further lodgments by November of 1990 stood at £24,005.95. This was an ordinary resident call account. Mr. Foley has informed the Tribunal that Mr. Traynor indicated to him that he, Mr. Traynor, proposed to close the account and transfer the balance to what Mr. Foley calls his investment account. The documentation made available to the Tribunal by Mr. Foley and which, according to Mr. Foley, was provided to him by Mr. Collery in May 1999, includes reference to a number of coded accounts kept by Ansbacher Limited in the names variously of Ansbacher Limited and Hamilton Ross. One set of these account statements has the account code A/A40 and the other set has the account code A/A49. The first reference to Hamilton Ross on these documents in respect of the coded account A/A49 is on the 4th January 1993. The account for that date shows a credit of £27,262. It’s on the overhead projector at the moment – the statement of account reads Ansbacher Limited, Hamilton Ross and the code is on the right hand corner A/A49. The Tribunal has not been able to obtain the orders of these coded accounts for any period prior to the 30th September 1992. However, in examining other material concerning transactions involving companies associated with the operation of the Ansbacher accounts, the Tribunal’s attention was drawn to a lodgment in the sum of £24,005.95 (which it will be remembered was the closing balance on Mr. Foley’s resident deposit account with Guinness & Mahon) to Kentford Securities Limited at Guinness & Mahon on the 6th December 1990. From other documentation made available to the Tribunal, it would appear that this represents the proceeds of a cheque drawn on a Bank of Ireland account at 48 Talbot Street, Dublin, in the name of Management Investments Services Limited, a company associated with Mr. Sam Field-Corbett. The cheque was in the amount of £24,005.95. It would appear from that account that there had been an identical lodgment by way of giro credit to that account of the sum of £24,005.95 on the 3rd December 1990. Sorry Sir, because this is fairly detailed. I will go back over the documentation if that meets with your approval. I will start again. The first thing that was drawn to the Tribunal’s attention was a lodgment to the Kentford Securities account in Guinness & Mahon in the sum of £24,005.95. That being the equivalent to the balance on Mr. Foley’s resident call account at Guinness & Mahon — the closing balance. Those funds represent the proceeds of a cheque in the same amount and it’s not very clear on the overhead projector, it’s in the same amount made payable to Kentford Securities drawn on the account of Management Investment Services Limited No. 2 account with the Bank of Ireland at Talbot Street, Dublin. This was signed by Mr. Field-Corbett. Now if we could then put up the account of Management Investment Services Limited at the Bank of Ireland in Talbot Street. This shows a giro credit to the account of Management Investment Services Limited of the same sum — £24,005.95 — and below that, a debit equal to that exact sum represented by a cheque. And that, the Tribunal has been informed, is the cheque made payable to Kentford Securities Limited in exactly the same sum of money. The cheque in question, that is the Management Investment Services cheque in question in the sum of £24,005.95, has been made available to the Tribunal, and from other documentation made available to the Tribunal, it would appear that the giro transaction was carried out by Mr. Patrick McCann, an associate of Mr. Sam Field-Corbett, who has also provided a statement to the Tribunal. While the Tribunal has not as yet obtained any comment from Mr. Foley concerning this matter, it would seem nevertheless that a question which arises is as to why such a roundabout method was adopted to effect a very simple transfer of funds which could have been effected by debiting the Guinness & Mahon account with the sum of money in question and lodging the exact same sum into the Kentford Securities Limited account or, alternatively, by effecting a straightforward transfer between the two accounts. Any such straightforward transfer between the two accounts, however, would have been left a very obvious record or trail indicating a clear connection between the two accounts within Guinness & Mahon itself. Firstly, statements of account in the form of the A/A49 account which I have already referred to. Thirdly, other handwritten documents containing coded lists of Hamilton Ross clients or customers. Some of the names on the coded list of Hamilton Ross clients or customers were already known to the Tribunal. In the course of the investigatory phase of its work and in endeavouring to form a picture of the Ansbacher accounts, the Tribunal had taken evidence at public sittings from which the public were excluded so as to identify the beneficiaries of Ansbacher and Hamilton Ross funds and, so far as possible, to identify the persons associated with the funds passing through the Ansbacher operation in this country, both on a back-to-back basis and otherwise. In the course of those public sittings, the Tribunal brought to the attention of Mr. Padraig Collery a number of coded account references which it was unable to identify with any individual. In the course of those sittings, Mr. Collery had provided the Tribunal with the names of a number of individuals associated with the Ansbacher funds and had, in particular, identified a number of individuals associated with particular codes. One of the codes mentioned in the course of those public sittings was A/A40. In the course of those public sittings, the Tribunal was informed that this code applied to funds held for the benefit of the late Mr. John Furze. The documents provided to the Tribunal by Ms. Keogh included documents containing the identities of the persons associated with various account codes. The documents in question had been generated by Mr. Padraig Collery and he, Mr. Collery, has so confirmed this. The documents were in fact generated by Mr. Collery in the course of a visit to the Cayman Islands in July of 1998. They were generated, as I will indicate in a moment, in the course of dealings Mr. Collery had with a Mr. Barry Benjamin, a person who has succeeded Mr. Furze in the Hamilton Ross operation in the Cayman Islands. The list in question, in Mr. Collery’s handwriting, identifies the code, A/A40 with Mr. D. Foley. Mr. Collery has confirmed that this was intended to refer to Mr. Denis Foley. The other names on the list have been excluded from what is showing on the overhead projector at the moment. The Tribunal has raised a number of queries with Mr. Padraig Collery concerning the fact that these documents and this information appears to have been in existence for some considerable time and that neither the documents nor the information was brought to the attention of the Tribunal. 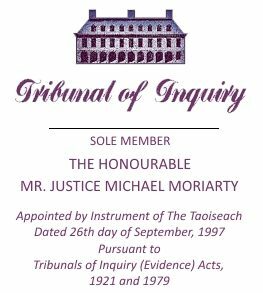 The Tribunal’s interest in endeavouring to pursue these inquiries is with a view to ascertaining why, notwithstanding the activities of two Tribunals of Inquiry and numerous other investigating agencies, this information and these documents was not brought to the attention of this Tribunal and as to what prompted the continuing secrecy surrounding the operation of these accounts right up to two months ago. Mr. Collery has informed the Tribunal that the reason he cross referenced the account coded A/A40 with the name of Mr. John Furze is that he was unclear then as to who were the true beneficial owners of the funds, although he now accepts that they either belong to Mr. Foley or his daughter and that he should have so advised the Tribunal. He has informed the Tribunal that his hesitancy in naming Mr. Foley or his daughter was due to a worry about not being 100 percent sure of the matter rather than any desire or reason to be unhelpful to the Tribunal. A number of queries concerning the identification of this account with Mr. John Furze and the circumstances which Mr. Colley has continued to be involved in the operation of the Ansbacher accounts has been raised with Mr. Collery and will require further investigation in the course of the Tribunal’s public sittings with a view to establishing that the Tribunal has as comprehensive an account as possible of all the circumstances surrounding Mr. Collery’s continued dealing with Ansbacher, bearing in mind that it was not until after Ms. Keogh made documents available to the Tribunal in 1999 that the Tribunal was informed for the first time of Mr. Collery’s visit to the Cayman Islands in July of 1998. There is a further feature of this visit which also merits additional inquiry. Once again, this came to the attention of the Tribunal only as a result of the provision of documentation by Ms. Keogh. From this documentation, it would appear that in the course of a lengthy seven-day visit to the Cayman Islands from July 1998, Mr. Collery generated a number of documents based on information which he had accumulated in Ireland and which he brought with him to the Cayman Islands. While in the Cayman Islands, Mr. Collery assisted in bringing up to date the balances on the various coded accounts kept within the Hamilton Ross pooled accounts. He updated a number of other accounts and made a number of other entries in various accounts kept in connection with the operation of the Hamilton Ross accounts. One of the exercises he carried out consisted of making deductions from the balances of the various account beneficiaries or customers in respect of legal fees incurred by Mr. John Furze in connection with the proceedings between him and the McCracken Tribunal before the Cayman court. The deductions from the balances of the various clients or customers of Hamilton Ross for legal fees do not appear to have been made pro rata according to their overall holdings in the Hamilton Ross pooled funds. The Tribunal has been in touch with a number of the individuals from whose balances deductions were made. It has been informed that those individuals did not consent to any such deductions and that indeed they were not aware of any such deductions having been made until they were so informed by the Tribunal. A feature of the deductions is that the sum of £5,000 was subtracted from Mr. Denis Foley’s A/A40 account for this purpose. It’s not very clear on the overhead, but you will see that — you will see £5,000, the deduction, and the legend is in respect of John A. Furze, legal fees — fees, in fact it says, and we have been informed by Mr. Collery that this was in respect of legal fees. And the date of the posting is referable to the 20th September 1997. Mr. Foley has informed the Tribunal that he knew nothing about this. Each of the other beneficiaries has, without any compulsion on the part of the Tribunal, furnished the Tribunal with a waiver of confidentiality and an authority and direction to Mr. Barry Benjamin and Hamilton Ross to provide all the information and any documentation he has concerning the operation of these accounts. Solicitors acting for Hamilton Ross within this jurisdiction have indicated in response to each and every one of these requests that they have no instructions from their clients. When the Tribunal, through its solicitor, indicated that it proposed to treat this response as a refusal to provide any information notwithstanding express directions from Mr. Benjamin’s and Hamilton Ross’ client, the solicitors indicated that once again they had no instructions from their clients. The Tribunal has since taken up the matter with the Cayman Island Monetary Authority, a regulatory authority operating in the Cayman Islands with jurisdiction over the regulation of financial services in that jurisdiction. Although to date the Tribunal has received no response from this agency, the Tribunal’s solicitor has received a telephone call from a Cayman Government lawyer indicating that the Tribunal should make an application to the Grand Court of the Cayman Islands and that that would be the appropriate way to go about seeking the information. In light of the experience of the McCracken Tribunal, it is unlikely that this approach will be adopted by this Tribunal. One of the features of the investigatory climate in this jurisdiction over the past three years has been the number of inquiries instituted by both the Executive and the Dail. As a result of recent legislation, the report of Mr. Ryan, the Authorised Officer appointed to examine the books and documents of Ansbacher (Cayman) Limited has been furnished to the Tribunal. As the document and its various appendices is voluminous and reflects an enormous amount of work carried out by Mr. Ryan over a considerable amount of time, the Tribunal has not yet had an opportunity of examining it in detail. However, from an initial examination of the report and of the accompanying material, it would appear that the authorised officer has, in general, formed the same impression of the Ansbacher accounts as that formed by the Tribunal in the course of its investigatory work. There are a number of minor differences of detail. The thrust of the Authorised Officer’s report has a more specific accountancy focus. So far as the identification of individuals associated with the Ansbacher accounts are concerned, there would appear to be little or no difference between the result of work carried out by the Authorised Officer and the results of the work carried out by the Tribunal, with the marked exception of the information which became available to the Tribunal as a result of documents furnished by Ms. Keogh. It is clear that that information was only not made available to the Tribunal but appears not to have been brought to the attention of the other investigatory authorities. There is one further matter concerning Mr. Denis Foley which the Tribunal will wish to pursue in the course of its public sittings and this concerns a back-to-back loan advanced by Guinness & Mahon to Central Tourist Holdings Limited, a company of which Mr. Foley, together with Mr. John Byrne and the late Mr. William A. Clifford and Mr. Thomas Clifford were directors. From documents made available to the Tribunal by Guinness & Mahon, it would appear that a sum of the order of £70,000 was borrowed by Central Tourist Holdings in or around June of 1972 and that that borrowing was backed by a security described by the coded reference which I have already mentioned, namely “suitably secured”. It appears that this was one of the badges of an Ansbacher-backed loan. The loan was renewed from time to time and eventually by the time the loan was cleared, the debit balance stood at £135,510.68. It would appear that the loan was ultimately repaid on the 4th September 1985 and that the source of the credit to the account to pay the loan was a transfer of funds from Guinness & Mahon Cayman Trust/College Call Account No. 06040454. A small additional sum to make up the full balance was withdrawn from an Amiens Securities Limited account and in a memorandum of one of the bank’s officials, Mr. Pat O’Dwyer, dated 16th October 1985, it was confirmed that the loan had been fully repaid. This is the memorandum from Mr. Pat O’Dwyer, dated 16th October 1985. “The following is the situation in respect of up to date accounts requested by you”, which refers to a number of loan accounts and they have been eliminated from the document on the overhead projector and they show Central Tourist Holdings, account fully repaid. A curious feature of the loan is that although apparently cleared on the date mentioned above, documents appear to be generated within the bank giving the impression that the loan continued to be outstanding. There is an account statement in respect of November of 1985 and it shows the indebtedness, then the credit to the account and the account stands at a zero balance. Further is a statement purporting to be in respect of the loan to Central Tourist Holdings in 1986 showing interest being added to the account and interest had obviously previously been added in other statements and the balance as being represented on this statement as standing at £149,000-odd. Mr. Foley has provided the Tribunal with a Memorandum of Evidence concerning this borrowing. However, this feature of the loan mentioned above and the fact that an impression was given that the loan was still outstanding after it had been paid has only just been brought to his attention and he has not yet made a comment in relation to it. He has stated that to his knowledge, the company’s solicitor, the late Mr. Joe Grace and the company’s accountant, Haughey Boland, reached a compromise with Guinness & Mahon and the Revenue Commissioners, presumably the main debtors of the company, and that as a result of this compromise, he himself had to make a payment of £5,000 towards the discharge of debts due to the company’s creditors and a further payment of £2,787.58 towards the discharge of the amounts due to the Revenue Commissioners. The Tribunal has also brought this matter to the attention of Mr. John Byrne from whom further information is awaited in dealing with the queries which I have just mentioned. In addition to Mr. Denis Foley, two further public office holders have come to the attention of the Tribunal in connection with the operation of the Ansbacher accounts. They are, Mr. Peter Sutherland, former Attorney General, and the late Mr. Hugh Coveney, former Government Minister and Minister of State. Mr. Sutherland’s involvement in the Ansbacher operation arises in connection with Term of Reference (c). He was not himself the source of or the person entitled to any funds in an Ansbacher account nor was he in any way connected with the source of any funds to any coded Ansbacher account. Term of Reference (c) of the Tribunal’s Term of Reference applies to payments to the holders of public office from Ansbacher accounts. Payment within the meaning of the Term of Reference has been defined or interpreted as including money and, in addition, any benefit in kind. The Tribunal has interpreted benefit in kind as embracing the provision of the facility of a backing security where that security consists of an offshore deposit of funds connected with the Ansbacher accounts. Mr. Peter Sutherland has not come to the attention of the Tribunal as a person who was the source of an Ansbacher account or as a person entitled directly to any funds from an Ansbacher account. The Tribunal’s attention was first drawn to Mr. Sutherland in the context of a back-to-back arrangement connected with a provision of bridging finance to enable him to purchase a family home in Dublin in 1976. “Dear Sir, This is to confirm that our above-mentioned client has agreed to purchase the above premises for £37,000 and a sum of £5,000 has been paid by this office by way of deposit on his behalf. “It is understood that you have agreed to provide our client with accommodation in the amount of £5,000 to cover such deposit and we would be glad if you would hand the bearer a bank draft in our favour for £5,000 to reimburse as for the payment by us of the sum referred to above. “To hold the documents of title in respect of the above premises in trust for you pending the discharge of this undertaking. Yours faithfully…” The names of the solicitors. The undertaking in respect of the proceeds of the sale of the then existing family home is not mentioned in the letter but is referred to in the credit committee memorandum in the bank and it was complied with. None of the correspondence between the bank and Mr. Sutherland’s solicitors, nor any of the bank’s formal facility letters, refer to any form of security other than that I have just indicated. The loan in question, however, although initially envisaged to be in the form of bridging finance, was extended from time to time and was not in fact cleared until mid-1980. In the initial loan decision memorandum (that is an internal bank document) the security for the bridging loan is referred to as the solicitor’s undertaking which I have just indicated on the overhead projector. In all subsequent bank internal documentation concerning this bridging finance, the security is described as being “suitably secured”. It is true to say that unusually, the internal memoranda also contains in the case of a memorandum of the 7th January 1977, a reference to the fact that, in addition to being suitably secured, there was also a solicitor’s undertaking. The documentation in question does not refer expressly to any particular backing deposit. However, the loan file provided by the bank with the authority and at the request of Mr. Sutherland to assist the Tribunal contained one page of a bank statement in the name of Guinness & Mahon Channel Island “P3”. The statement relates to the period from April 28th 1976 to December 31st 1976 and the balance as of the latter date is £12,296.71. This entry appears to be consistent with a memorandum from Mr. Ru Leonard to Mr. Pat O’Dwyer dated 7th January 1997. Mr. Pat O’Dwyer was responsible for maintaining loan or credit documentation within the bank. Mr. Ru Leonard was the individual with whom Mr. Sutherland was dealing in connection with this loan. Mr. Ru Leonard was also the person who preceded Mr. Padraig Collery in maintaining the records of offshore depots in connection with Channel Island or Cayman depositors, that is Ansbacher deposits at Guinness & Mahon under the control of Mr. Desmond Traynor. In the memorandum which is on the overhead projector, Mr. Leonard, in response to a query from Mr. O’Dwyer to confirm whether the position was “suitably secured” stated that there was £12,000 on deposit. It is only fair to point out that he went on to say that Mr. O’Dwyer would also find that the bank had a solicitor’s undertaking as the transaction was a normal bridging situation. It would appear from information provided by Mr. Sutherland concerning his accounts at Guinness & Mahon that he had no deposit account at the bank at that time and from this, it would appear that the £12,000 referred to is the sum of £12,000-odd on deposit in the name of Guinness Mahon Channel Islands “P3”. Mr. Sutherland has provided the Tribunal with his full assistance in endeavouring to assemble all the documents material to this transaction. This includes the documentation in Guinness & Mahon and although Mr. Sutherland has indicated that he has no recollection of making any arrangement with Mr. Ru Leonard in connection with the provision of security for his bridging finance in the form of a backing deposit consisting of funds in the Channel Islands offshore account and he has further indicated that he is aware of no such account connected with his bridging loan, he has informed the Tribunal that his father-in-law, a Spanish national and resident in Spain, had established a discretionary trust in the Channel Islands and that this had been established through Guinness & Mahon. Mr. Sutherland has not been able to establish whether the “P3” account is one and the same as the account held in the discretionary trust. He has, however, provided the Tribunal with documentation from his Spanish relatives and from Spanish lawyers indicating how the trust in question was set up and how Irish tax advisers were involved in choosing the form of trust and the location of the trust funds. It appears from documents made available from Mr. Sutherland that these funds originally settled in the Channel Islands were ultimately resettled in January of 1980 in the Cayman Islands with Guinness Mahon Cayman Trust. The late Mr. Hugh Coveney was a Minister and comes within the ambit of Terms of Reference under Term of Reference (b). This Term of Reference requires the Tribunal to inquire into the source of any money held in the Ansbacher accounts inter alia for the benefit of any person who holds or has held ministerial office. From information made available to the Tribunal from Guinness & Mahon and further from information made available by Mr. Coveney prior to his death, it would appear that Mr. Coveney’s association with Ansbacher Cayman may be divided into two parts; firstly, Mr. Coveney’s involvement with Guinness Mahon offshore operations in the Channel Islands and in the Cayman Islands mainly in the 1970s and, secondly, his dealings with the Guinness Mahon Cayman Islands operation in the 1980s in connection with an American commercial venture. The second of these involvements is the one in respect of which the Tribunal has had the benefit of obtaining the most detailed response from the late Mr. Coveney. It would appear that in 1980 Mr. Coveney, together with two friends of his, became involved with an American in a property development investment of a 90-acre mobile home park near Phoenix, Arizona. A group of businessmen, many of whom had associations with Guinness & Mahon ultimately became involved with Mr. Coveney in the venture. It was envisaged that a tax strategy would be developed whereby three American investors would put up 50 percent of the investment and the balance would be provided by non-US partners operating from an offshore location. Prior to his death, Mr. Coveney informed the Tribunal that the structure envisaged the establishment of an entity known as the Lynbrett Trust; that Guinness Mahon Cayman Trust became trustees of that trust and that the beneficiaries of the trust would be five registered Cayman Island companies. It was envisaged that the late Mr. Coveney would be given an opportunity to acquire one of these companies, named Eclipse Holdings Limited. The finance for the venture was to be provided by Allied Irish Bank New York, by whom some US$2.775 million were to be lent to Lynbrett Trust who, in turn, agreed to lend this sum to an American resort company which was responsible for carrying out the developments. The finance arrangement involved the provision of joint and several guarantees by the five Irish participants and the late Mr. Coveney signed his guarantee at AIB’s office at 66 South Mall, Cork on the 23rd June 1981. In addition to the borrowing of US $2.775 million to be provided by Allied Irish Banks, the Lynbrett Trust was also required to put up a further US $950,000 towards the initial cost of the development. According to a statement provided by the late Mr. Coveney, his share of that sum amounted to $212,500 and he negotiated a venture capital arrangement with Mr. Desmond Traynor acting for Guinness & Mahon Cayman Trust to provide him with that sum. The sum was provided by way of a further loan facility from Guinness Mahon Cayman Trust to Eclipse Holdings, the company mentioned already. Mr. Coveney’s option to acquire the ownership of all the shares at Eclipse at par (for £50) was provided in exchange for a personal guarantee of £50,000 sterling of Eclipse borrowings. The option did not itself become exercisable until Eclipse had recouped all of its borrowings out of its share of the profits of the American venture. Ultimately, the entire venture proved to be a disaster and, although initially the funds used to provide Mr. Coveney’s share of the investment came from borrowings in the end he suffered considerable losses in that his sterling guarantee in return for which he was given an option to acquire shares in Eclipse was called in, resulting in a £50,000 sterling loss. In addition, Allied Irish Banks in New York called in the personal guarantee in consideration of which they had provided sums to Lynbrett. After some litigation, Mr. Coveney’s ultimate share of the cost of a settlement with Allied Irish Banks was in the order of US $500,000. Mr. Coveney’s involvement with Guinness Mahon Cayman Trust was purely a commercial one involving a loan account rather than a deposit account, and it seems to have concluded somewhere in or around 1987. Mr. Coveney’s earlier involvement with Guinness Mahon Cayman Trust involved the operation of offshore deposits bearing all the badges of the Ansbacher operation, in as much as the accounts in question were coded at least in part, a form of Guinness Mahon Cayman Trust Limited. These deposit accounts appear to have operated from 1972 to 1979 and there appears to have no involvement after 1979 which was some two years prior to the date in which Mr. Coveney was first elected to the Dail. Prior to his death, the late Mr. Coveney provided very considerable assistance to the Tribunal regarding his association with Ansbacher and his dealings with the late Mr. Traynor. Since his death, his family have further assisted the Tribunal and have made extensive inquiries as to the sources of these deposits which were in the main held in US dollars. From the documents and information provided, it appears that the sources of these deposits were entirely of a private and commercial nature, and may substantially be accounted for by the proceeds of the sale of a racing yacht, “Silver Apple”, which was sold by Mr. Coveney in Newport, USA in 1975. That, Sir, is the completion of the outline statement at the moment. Matters may arise in the course of the sittings which would warrant further indication to the parties involved and to the public where the Tribunal is going in its inquiries and that would be done, if necessary, in due course.